In many schools and districts, the local curriculum is a hodgepodge of individual initiatives knit together by collective good intentions. Succeeding with Standards: Linking Curriculum, Assessment, and Action Planning describes a practical, school-tested solution to the challenge of creating a curriculum. 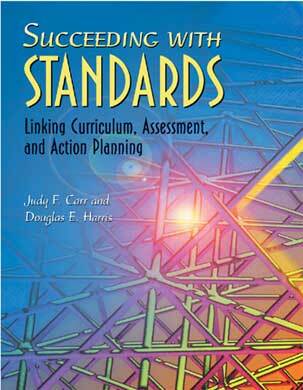 Building on their work in How to Use Standards in the Classroom, Judy F. Carr and Douglas E. Harris describe a comprehensive process by which schools and districts can turn piecemeal initiatives into a coherent plan. They also consider how to approach reporting results and professional development in a standards-based environment. Improved student performance is the centerpiece of all these standards-linking processes. Carr and Harris emphasize this point, clearly keeping Standards Linking in the context of bettering academic performance for all children. Plentiful figures and examples highlight Carr and Harris’s insights and advice. An extensive glossary and helpful list of selected resources round out the volume. JUDY F. CARR and DOUGLAS E. HARRIS are Directors of the Center for Curriculum Renewal, a consulting group providing professional development and technical expertise in standards-based learning, leadership development, mentoring and colleague support, and building assessment and reporting systems to educators, associations, and businesses throughout North America.